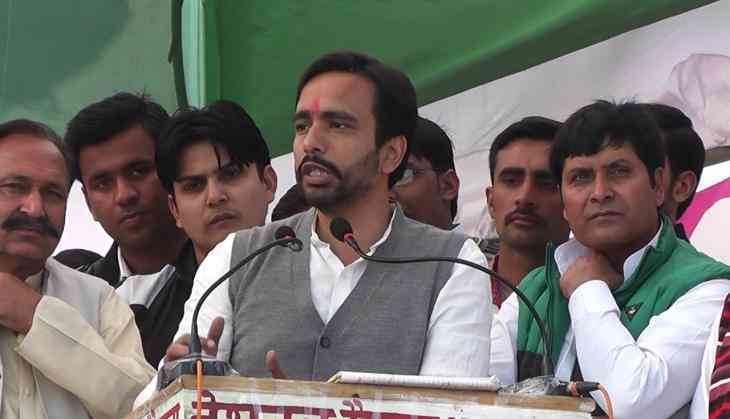 In a statement that can spark a controversy, Rashtriya Lok Dal (RLD) leader Jayant Chaudhary called BJP a 'jutiya' party while addressing a public gathering in a village here on Sunday. While referring to Prime Minister Narendra Modi calling alliance of BJP-SP-RLD as 'Sharaabi', Chaudhary reminded people of an incident of a shoe-fight between a BJP MLA and MP and said, "There bad time is coming. They will call you alcoholic, they will call it adulteration but I have also thought of a name for them. They are well versed in fighting with shoes. I don't want to abuse them but these are very big 'jutiya' and it is a big 'jutiya' party. This is a fight of identity and lot depends on it." On March 6, BJP MLA Rakesh Singh Baghel got into a fist fight with MP Sharad Tripathi during an official meeting at Sant Kabir Nagar in Uttar Pradesh. Initially, both of them had a verbal argument over the placement of names on a foundation stone of some development project. However, the argument soon turned ugly as the two leaders got into jostling, pushing each other and ultimately fisticuffs. Tripathi had hit Baghel with his footwear to which the MLA also retaliated by slapping the MP. On March 28, coining a new acronym 'Sarab', Prime Minister Narendra Modi took a swipe at the SP-RLD-BSP alliance in Uttar Pradesh, saying the alliance will do harm to the people of the state. The Prime Minister had said: "Take 'sa' from Samajwadi Party, 'ra' from Rashtriya Lok Dal and 'b' from Bahujan Samaj Party, it would make Sarab," he said at a public rally in Meerut. Addressing another public gathering on the same day, Chaudhary also threatened BJP of dire consequences if farmer loans were not waived. "Lies won't work anymore. Elections come and go and we are not worried about it. I am telling Modi ji, let elections happen or if he does it (loan waiver) before elections even better. Whatever is owed by farmers of state is about Rs 13,000 crore... BJP has made a grand central office worth Rs 1500 crore in Delhi...don't know it has lift, swimming pool, marble floors, all expensive things must be there... If they make a mistake, Chaudhary Ajit Singh will make the announcement and we will go and vandalize every bit of the office", he said.